For a pure vegetarian like me, Sweet Chili Sauce was the only savior in our Australia tour. 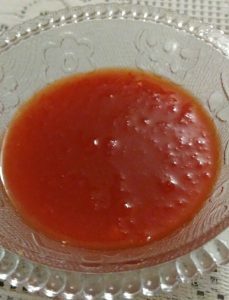 I’ve made this sauce at home a number of times. It’s an easy recipe. It requires very few ingredients. I’m sure you will like it. 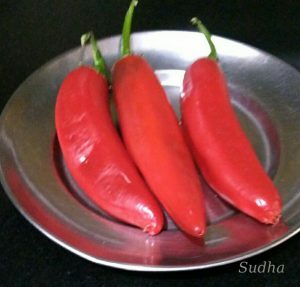 Fresh Red Chilies that are used for this sauce are available in Jan-Feb in India. 1. Wash and dry red chilies. Slice chilies in half. Remove seeds and veins. Seeds and veins are the most spicy portions of Chilies. It you want more hot sauce, you may use a few / all seeds and veins in the sauce. 2. Chop chilies into medium size pieces. In a blender combine chilies, garlic, sugar, lemon juice and salt. Add little water if required for blending. Blend until only fine flakes of chilies remain. Do not over grind to make a smooth paste. 2. Transfer the mixture to a pan and simmer over medium heat till you get required consistency of the sauce. Keep stirring regularly. Add more sugar if required while Sauce is simmering. Sauce will thicken as it cools. So don’t make the sauce too thick. 3. Enjoy this delicious sauce. 1. Be careful while handling these chilies. Wear hand gloves or use a paper napkin to hold Chilies while chopping. 2. 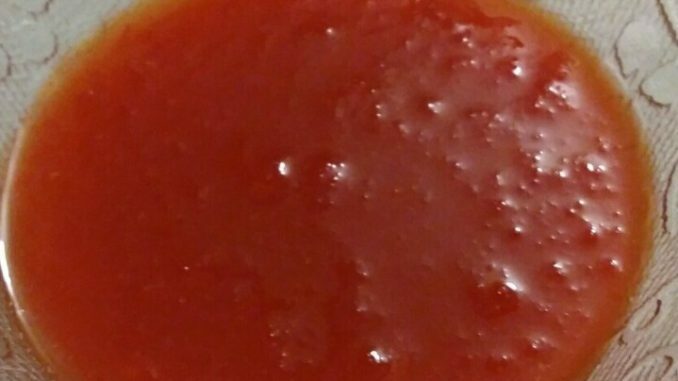 You can store this sauce in refrigerator for 8-10 days. 3. If you want to store it for 5-6 months, reduce lemon juice to 2 tablespoons and mix 1 tablespoon of Vinegar when the the sauce cools to room temperature and then store it in refrigerator. हे तिखट आणि जरासं गोड सॉस खूपच चविष्ट लागतं. आपल्याकडे जानेवारी – फेब्रुवारी त लाल जाड्या तिखट मिरच्या मिळतात त्या वापरून हे सॉस बनवतात. हे सॉस तुम्ही कशाही बरोबर खाऊ शकता. सॉस कमी तिखट हवं असेल तर ह्या मिरच्या मधे कापून त्यातल्या शिरा आणि बिया काढून टाका नाहीतर शिरा / बिया घालून हे सॉस बनवा. १. मिरच्या धुवून उभे दोन तुकडे करा. बिया आणि शिरा खूप तिखट असतात. तुम्हाला कमी तिखट सॉस हवं असेल तर बिया आणि शिरा काढून टाका. जास्त तिखट सॉस साठी सगळ्या / थोड्या बिया / शिरा वापरा. मिरच्यांचे मध्यम आकाराचे तुकडे करा. २. मिक्सर च्या भांड्यात मिरच्या, साखर, लिंबू, लसूण आणि मीठ घालून किंचित जाडसर वाटून घ्या. मिरच्यांचे छोटे तुकडे राहू द्या. ३. एका पातेल्यात मिश्रण घालून मंद उकळा. मध्ये मध्ये ढवळत राहा. सॉस उकळताना चव बघून आणखी साखर घाला आणि उकळी काढा. मिश्रण हवं तेव्हढं दाट झालं की गॅस बंद करून मिश्रण थंड करा. सॉस थंड झाल्यावर दाट होतं म्हणून आधी फार आटवू नका. ४. सॉस गार झाल्यावर हवाबंद बरणीत काढून ठेवा. हे सॉस कशाही बरोबर छान लागतं. १. ह्या मिरच्या चिरल्यावर हाताची आग होऊ शकते म्हणून हाताळताना काळजी घ्या. हातात ग्लोव्ह्ज घाला किंवा मिरच्या रुमालात / नॅपकिन मध्ये धरून चिरा. २. हे सॉस ८–१० दिवस फ्रिज मध्ये टिकेल. ३. सॉस ५–६ महिने ठेवायचं असेल तर वरील प्रमाणात लिंबाचा रस २ टेबलस्पून करून सॉस थंड झाल्यावर त्यात १ टेबलस्पून व्हिनेगर घालून मिक्स करा.